The cougar (or puma) is found in North, Central, and South America. It is very closely related to the common house cat and does very well in captivity. Unlike the other big cats, the cougar cannot roar and purrs like the house cat. 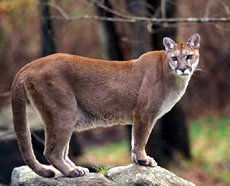 Three of the over 20 subspecies of the cougar are endangered: the Florida panther (Puma concolor coryi), the Costa Rican Puma (Puma concolor costaricensis), and the Eastern Puma (Puma concolor couguar). The color and thickness of the coat of the cougar varies according to region and subspecies, but generally, cougars are tawny-colored with black-tipped ears and tails. Cougars can run up to 43 mph and can jump 20 feet from a standing position. They can leap a distance of 16 feet vertically. Size also varies according to subspecies. North American cougars can grow up to eight feet long and can weigh up to 150 lb. Cougars can kill prey up to seven times their body weight. Diet consists of large mammals, such as deer and elk. They also sometimes eat smaller animals, such as beavers, porcupines, or even mice. Like other cats, the cougar prefers to ambush its prey mostly from behind. They are also territorial and solitary only coming together to mate. They are generally shy animals and prefer to avoid humans. Males may breed with several females. The female gives birth to three or four kittens after a gestation period of 82 to 96 days. The cougar species as a whole has made a dramatic recovery with over 30,000 in the US alone. The main cause of decline is loss of habitat. Only 30 to 50 Florida panthers remain in the wild today. Cause of decline for the Florida panther is human development and population growth in Florida, and some panthers are killed by collisions with vehicles. Eastern puma populations are said to be between 20 and 100 individuals. Estimated population for the Costa Rican puma is unknown. Copyright Notice: This article is licensed under the GNU Free Documentation License. It uses material from the Wikipedia article "Cougar". Glenn, C. R. 2006. "Earth's Endangered Creatures - Cougar Facts" (Online). 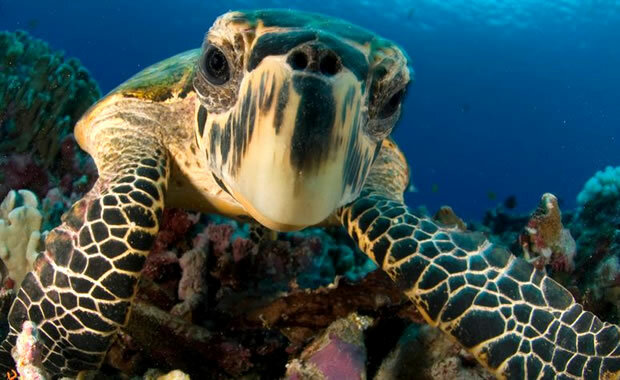 Accessed 4/25/2019 at http://earthsendangered.com/profile.asp?sp=737&ID=9.